Island Press was founded by by Canadian poet, musician and (then) Sydney University lecturer Philip Roberts in 1970. In 1979 Roberts returned to Canada and gave Island Press to Philip Hammial who ran it by himself until 1993 when it was transferred into a Co-operative. This year the Press celebrates 45 years as an active poetry publisher – probably making it the longest running poetry press in Australia. 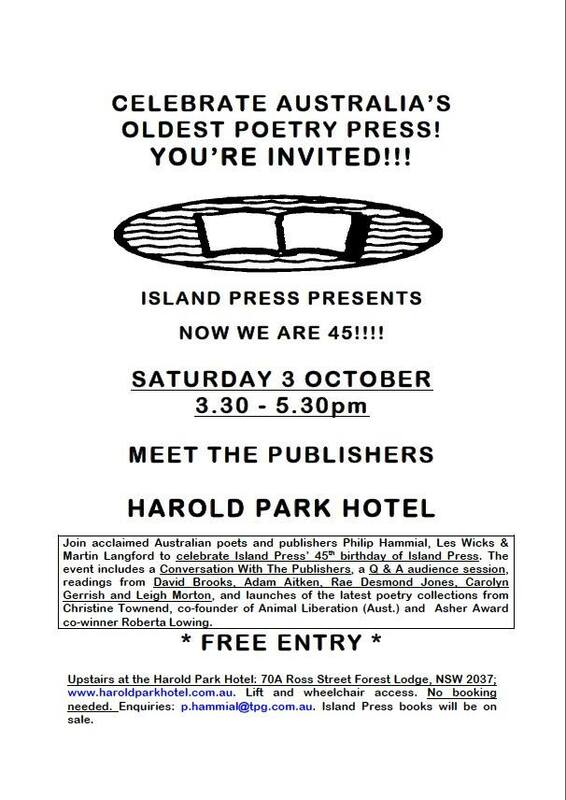 It is celebrating its birthday on Saturday 3rd October at 3.30pm at the Harold Park Hotel in Sydney with with readings from Island Press poets, & the launch of the latest poetry books from Philip Hammial, Christine Townend and Roberta Lowing. I started Island Press in 1970. It was an act of defiance, in a way. I had been ordered back to bed for a month after a relapse of suspected incipient multiple sclerosis, but instead set out from the neurologist’s rooms to Dolphin and Hannan on the outskirts of Parramatta and bought a Jewel treadle platen press and six fonts of Garamong type. During that month, not only did symptoms of my supposed ailment disappear, never to return, but I became a printer, a traveller of the Gutenberg galaxy, with all its miraculous reality. I had always been fascinated by print and printing. When I was two I picked up an “error” of spelling in my own name (on the label of a bottle of Phillip’s Milk of Magnesia). Not many years later I was “printing” books on an ancient typewriter, and “binding” them on my grandmother’s treadle sewing machine. (This is not good for the needle, I was later informed.) I recall that the magic of the transformation from flat sheet to openable book was my principle source of pleasure. At high school I was editor of the annual Retropect’s first printed (as opposed to mimeographed) edition, and went on to become the editor of two undergraduate student publications (one, The Acadia Athenaeum in Nova Scotia in 1959, and the other the Jesus College, Oxford, Dragon a few years later). I became a professional, so to speak, during a couple of frustrating, and, ultimately, dull, years as a sub-editor in the chaos of Reuter’s Central Desk in Fleet Street. I also sub-edited and ghosted on the side. Correcting printer’s proofs was a common task for me. Moreover, I had friends with an active interest in printing. 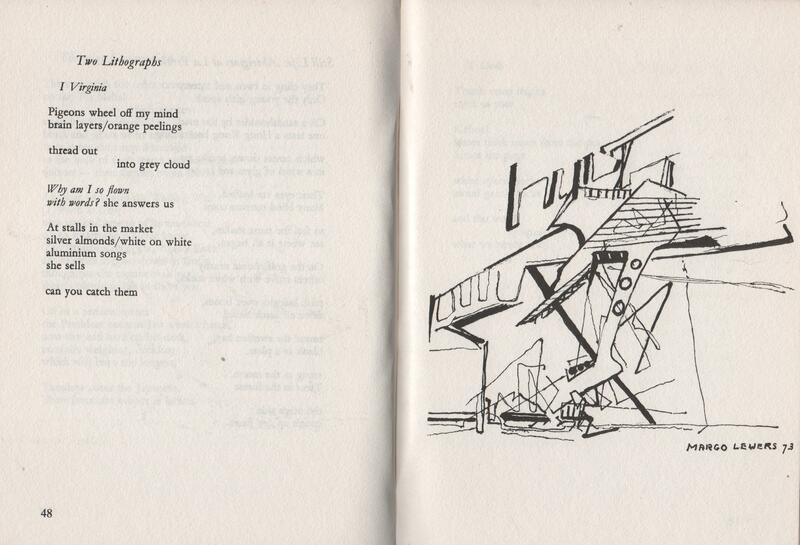 An undergraduate friend at Oxford, David Bridges, had a small Adana Press, on which he planned to print (but only got as far as proof stage) my renderings of four Anglo-Saxon poems (these ultimately appeared in Crux, my third book). Also at Oxford I met Robert Graves, then Professor of Poetry. Early in our Friendship he presented me with three books he had printed with Laura Riding at their Seizin Press. The first, the smallest, was An Acquaintance with Descriptions by Gertrude Stein. They had printed this in Hammersmith, and Gertrude had had to sign bits of numbered paper in Paris and then post it back to Hammersmith to be stuck into the books. The second and third had been printed in Deya, Mallorca, where Robert still lives. They were To Whom Else by Robert himslef (he was very apologetic about the quality of the poetry in this) and Laura and Francesca by Laura herself. Finally, in 1969 my first book of poems, Just Passing Through, had been handset and printed by a young couple of poets in Canada, Sean Haldane and Marnie Pomeroy. Their Ladysmith Press was on their farm in Ladysmith, Quebec, near Ottawa. Their interest in printing was entirely coinci dental, but it was a boost to my own—redoubled when I discovered in later correspondence from Canada that both Sean and Marnie had known Robert well. This led to a lively exchange of correspondence between Ladysmith, Sydney, and Deya, the main topic of which was printing. Having edged the new Jewel into our laundry up by the road at 9 Bayview Street, Lavender Bay, in Sydney (an act for which I was later—over a year later—to be evicted), I now had no clear idea of how to proceed. I had a few books, including a rat-gnawed Victorian manual given to me by Mr Edwards of Edwards & Shaw, Sydney, publishers of many fine collections of Australian poetry, and was able to distribute my founts into their respective cases, but I still was unable to print even a single line. One day, a stranger, a bass guitarist on his way to a session in a neighbouring flat, stuck his head into the laundry where I was wallowing in despair. It turned out that he was also an apprentice in printing at Sydney Tech. In an hour and a half he had taught me virtually everything I have ever needed to know about basic printing (I have to assume that I am still ignorant of many of the finer points), enough to think of doing a small book of poetry. I never thought of printing anything other than poetry. I already knew a few Sydney poets and one or two others in the other cities of Australia, and the idea came to me of doing a small booklet, with one poem from each poet, the copies to be sold or else given away, and the proceeds to be equally split between us. One of these poets was David Malouf, a colleague at Sydney University, where I taught. He suggested a few more names. Eventually I ended up with 22. (These were Robert Adamson, David Campbell, J. M. Couper, Bruce Dawe, Robert D. FitzGerald, Rodney Hall, J. S. Harry, Gwen Harwood, Martin Johnston, Geoffrey Lehmann, David Malouf, James McAuley, Roger McDonald, Les A. Murray, Geoff Page, Philip Roberts, Thomas W. Shapcott, Vivian Smith, Andrew Taylor, John E. Tranter, Chris Wallace-Crabbe, and Judith Wright, for the record). The guiding principle was that each poet had to choose his or her best poem written during the previous year. Hence the significance of the position of the apostrophe in the title chosen for the anthology: Poet’s Choice — many choices, perhaps, but each of them singular. This new enterprise needed a name, especially if we (by now I had taken up referring to Island Press and myself together as “we” rather grandly) were planning to sell books and open a bank account. I had a block of land on Scotland Island, and had been planning to build and move over there in a year or two: “Island Press” seemed the right name. The fact that I ended up instead in Bundeena, in the Royal National Park south of Sydney, did not seem significant enough to cause me to change the name later, especially as it so well fitted my personal picture of myself as isolationist. I even drew a printer’s device, waves surrounding a book: the book as island. So I set out, armed with my new name and a sheaf of contributors’ mss., with a pile of brown-paper parcels of newly cut paper from B. J. Ball, each sheet the size of a two-page spread of the finished book. Then the fun began. I cannot possibly go into the minute and painstaking attention to detail that printing demands. One thing, however, the bass guitarist had told me, and the most important: be ready to resort to anything to achieve the best. Arm yourself with talcum powder, chewing gum, hairpins and rubber cement. Even the newest and most sophisticated Japanese offset press won’t give perfect results without a lot of prior fiddling-around and even witchery-pokery. The tao of printing is attained during the make-ready stage if it is to be attained at all. The business of typesetting is printing’s most time-consuming aspect. You stand there, hour upon hour, holding a metal composing-stick in your left hand, your right fingers fumbling endlessly among the 89 compartments of the case, picking up the desired piece of type, turning the character end around to face you, and then checking the face itself to make sure it’s the right way up, three operations to be repeated for each letter. It is gratifying to discover your fingers becoming quite used to this new routine, to the point where you no longer have to consciously consider the whereabouts of any particular piece of type. Next, each line of set type must be adjusted for spacing (happily, this is not a major problem in poetry, where the right print margin is seldom justified, or lined up evenly), then a one-point lead is dropped in and a new line begun. After five or six lines are set (this could take up to 15 or 20 minutes) the whole load is manoeuvred gingerly out of the stick and onto the “stone” (a sheet of thick glass, in my case) to sit level until the whole two-page spread is complete and in place, surrounded by other pieces of metal and wood (“furniture”) and locked up tightly with two expanding clamps (“quoins”). (By now I also had a whole new vocabulary to play with.) After the whole thing is clamped into the press, with all errors of typography and spacing now in the past, the process begins. A spin of the flywheel, a stomp on the treadle, and away she goes, with stops only to replenish ink or paper. Each sheet is placed on the platen by the right hand, and removed after printing by the left hand as the right is on its way over with a new sheet. You have to keep your eyes open to make sure none of the type is clogged, or that the rollers don’t need more ink. For me, the printing was the most enjoyable and relaxing part of the process. Friends used to call and marvel at my furious energy as I treadled away, clang-clang went the ratchet escapement of the circular ink plate, kerthwoosh went the two ink-sticky rollers across the plate then down over the type itself and back, just instants before the mighty jaws of the platen and bed crunched shut on the paper. One summer afternoon I cracked the knuckle of my right middle finger while diving for a piece of paper that had slipped down while the press was closing. I should have known better. I came to later with a lump on my head (the cement floor of the laundry) and a finger that has never been quite the same. It used to amuse me, at these times, that so many of my university and other literary acquaintances, who prided themselves on their knowledge of books and even gave WEA courses on communication, had never thought about the final part of the printing process—the distribution, or putting-away, of the type afterwards. They often appeared amazed, watching me at work, to see that once you take a piece of type out of its compartment and use it, you must clean it and put it back before you can take it out and use it again. But in fact, this was the easiest, and fastest, part of the process: with a copy of the newly-printed sheet before you, you don’t actually have to look at the type at all while you distribute. I have no idea how long Poet’s Choice 1970 took me—many weeks longer than I had first imagined, I’m sure. I used to spend all my free hours at the press, on the weekends, in the evenings, and whenever else I could find time. What makes Phil print? people were wondering. The flexibility of my time table at the university was a great advantage, though I did encounter some negative reaction over this from my immediate superior, and in general felt rather unsupported by the upper levels of the English Department, whose fodder is, after all, books, and particularly books of poetry. In 1976, when I gave up handsetting, I offered my press and type to the English Department but was told they had no interest in acquiring a press. Presumably they feel that students interested in bibliography should travel to Oxford to study letterpress printing, as generations have already done. From this beginning the Press just grew. Poet’s Choice 1970 was the first and only book from the Jewel press under my operations: I sold it to Michael Dransfield the following year (1971), and replaced it with a somewhat more sophisticated machine, an Arab treadle with adjustable platen. (The Jewel’s adjustments were made by adding or subtracting single sheets of the news paper I used for platen packing.) Michael got some Times Roman type (I think because it was more workable than my own Garamond, where founts are pretty limited), and printed a small book of poems for his father. I never saw the book, but I have a commemorative sheet we printed the afternoon we moved it over to his place in Paddington and got it working. From then until the end of my hand-setting days I produced nine further books, a total of 10 in all. Aside from the annual Poet’s Choice, which went on selling well each year, chiefly by mail order, I did four individual collections: End of Dreamtime by Kevin Gilbert in 1971; Ithaka by Martin Johnston and Crux by myself in 1973; and Swamp Riddles by Robert Adamson in 1974. The use of artwork introduced a theme that became common to many of the Island Press collections. Martin Johnston’s perceptive translations from modern Greek poetry, Ithaka, included drawings by himself and Nevill Drury, now a high prophet of extrasensory phenomena and sci-fi. 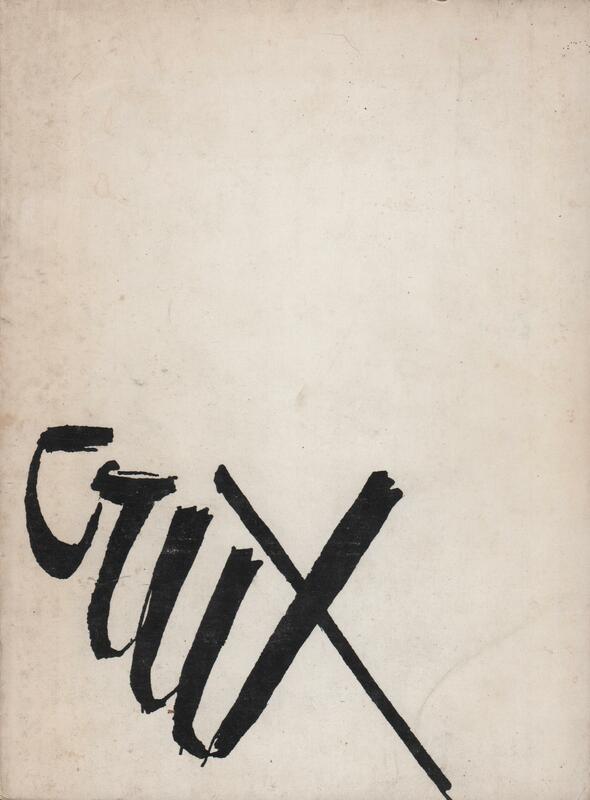 My book, Crux, had drawings by the late Sydney artist Margo Lewers, a good friend from my first days in Australia; she also designed the cover. 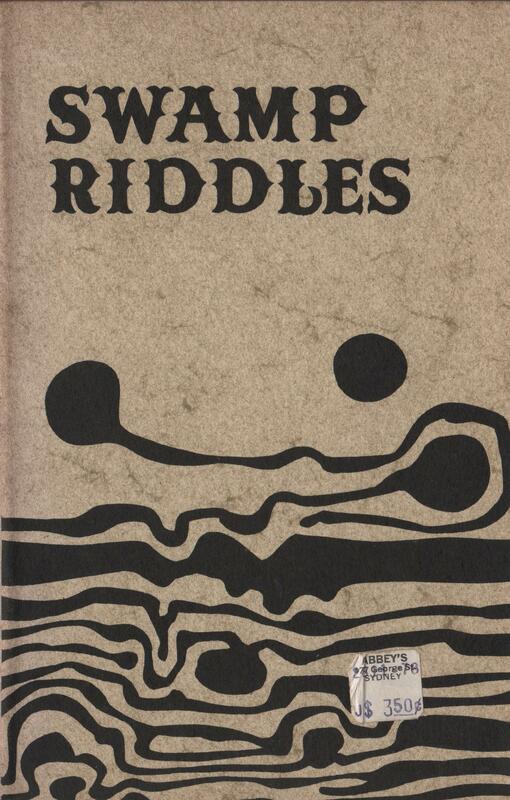 And Robert Adamson’s Swamp Riddles, which I would now submit as my best piece of printing, had a cover by Robert Finlayson. This cover was a real headache—Adamson had asked for Efanta cover board for the paperback covers. I had never printed on paper with this finish, and, much to my consternation, discovered that my usual black ink (regular jobbing variety) refused to sink into the paper or to dry. We even baked some of the sheets all night in the kitchen oven, to no avail. I finally had to buy a whole new order of cover stock and have a professional printer do the job. So my best book is not wholly mine, at that. Poet’s Choice 1975 was my last hand-set effort. By now the press itself had become physical drudgery. I hate to think of how many hours during those six years I spent balancing on my left foot while my right treadled up and down, four times for each impression, multiplied by 25, 30, or even 50 for each two-page spread in the book, multiplied (again) by 250, 500, or even 1000 for each copy of the final run. I was developing curvature of the spine and varicose veins in the left leg. It was getting to be a drag. I grumbled and threatened to chuck it all in, but in the end continued to allow myself to be persuaded (by other poets, mainly) to continue publishing even if I gave up printing the books myself. The deciding factor was the IBM typesetter, a kind of glorified “golfball” typewriter which produces pages of print ready, via photographic plates, for an offset press. So I could continue to do the typesetting, at vastly increased speed and comfort, while a commercial printer did the less exciting work of mass production. I soon hit upon Southwood Press in Marrickville, Sydney, a small, sympathetic, and generally competent printer and binder, and found that life as a publisher could be bearable. The first of the IBM jobs was Poet’s Choice 1976 (its cover is disingenuously a crude facsimile of the old Poet’s Choice cover, done just before I dismantled the press forever, and looking more rustic than anything I had ever printed myself). The move into mechanisation which this represented was a big step. It meant losing a number of bibliophiles and rare-book collectors as standing-order customers. On the other hand, I was now able to print, in a relatively short time, a range and diversity of poetry which I could never have managed in the old handset days—books by Philip Hammial (since July 1979, with his wife Karen,, joint owner of Island Press), Ken Bolton (a past editor), Andrew Taylor, Michael Witts, Keith Shadwick, Andrew Huntley, Denis Gallagher, Kris Hemensley, and Jan Harry. Running a Press this way means you can decide on a book and have it out in as little as six weeks—impossible for a large publisher. Moreover, you can give your poets and artists encouragement to plan all aspects of the book themselves—cover design, page layout, page area, illustrations, decorative typefaces, and so forth. I feel that Island Press poets have been, on the whole, happy with their books (though one of Brandon Cavalier’s memorable ink drawings for Michael Witts’s Sirens got printed upside down, a fact not too many readers seemed to pick up). Most of my other energies in running Island Press (aside from the continual chores of correspondence, order-filling, and account-keeping) have been devoted to running negotiations with two agencies: the Book Bounty Section of the Business and Consumer Affairs Department, which, up to the end of this year (1979), refunded one-third of the actual cost of production of any book in Australia, provided it fell within certain guidelines of length, print run, etc. Unfortunately, this bounty is now being phased out, and small presses will now find it harder and harder to survive. The other was the Literature Board of the Australia Council, formerly the Commonwealth (of Australia, that is) Literary Fund. The Literature Board scarcely needs introduction here. Its function is to apportion allocated funds from federal revenue to poets and other writers so they can continue their labours without starving (even though, as has been known since Larkin, “no one actually starves”), and to publishers so they can continue the otherwise financially unrewarding job of publishing the above-mentioned Australian poets and writers. In the C.L.F. days, the tricky bit was getting onto the official list of approved publishers. Usually this meant showing proof that you were capable of producing books which would elicit some (preferably favourable) critical attention. In spite of a great deal of reluctance on the part of the C.L.F. to consider an Island Press application seriously, I got nowhere in four years. I had a strong ally in this struggle in Alec Hope, and I remain grateful to him for his support, which culminated in our recognition just prior to the death of the C.L.F. and the rise of the newly-created Literature Board (Australia Council). Although my relations with the Board have at times been less than cordial, I nevertheless look upon its participation in Australian writing and publishing as a good thing. All correspondence with the Literature Board, along with all other Island Press letters, mss., printers’ proofs, and other papers, is now housed in the archives of the National Library of Australia. So far I have written as though I had been mainly alone in my labours. This is not true. From the earliest I had the strong support of a number of friends, of whom the chief of these, may her name live forever, was Norma Crinion of Sydney. Norma, long a behind-the-scenes worker in Sydney’s “alternative” publishing scene, had secretarial and accounting experience, and was so enthusiastic over the inception of Island Press that she volunteered to become its full-time secretary, accountant, and public relations manager. Unpaid for any of this, she continued her work for five years, on two different periods handling all the business affairs of the Press for many months while I was overseas. I occasionally later used to come upon a carbon copy of some letter she had written to an enquiring customer or to one of our contributors. They are invariably full of warmth and wit, and often elicited paragraphs of appreciation from her correspondents in return. I can never thank her enough for her help and support during the early years. Other friends aided during certain periods of the Press’s history. My old friend Robert Brakspear, colleagues Stephen Knight and Don Anderson, Ken Bolton and Anna Couani (who edited the Gallagher and the Hemensley books respectively) gave freely of their time and energies. Poet John Millett, a trained lawyer and accountant, was always available for legal and financial advice when it was needed. Encouragement has come from every quarter, including from my dog Jason, who was just a pup on the day I first printed, is still with me now, a printer’s devil of ten years’ standing. I can hardly conclude this reminiscence without mentioning that band upon whose very existence Island Press has -depended for its survival—the poets, contributors of poems and of whole collections. In general, I think I have been lucky in hitting it off rather well with most poets in Australia, usually being an observer rather than a participant in the frequent feuds and other hostilities that characterise the scene, particularly in Sydney and Melbourne. (The Canadian poet Margaret Atwood was told it was just a way Australian writers had of enjoying themselves.) That old war-dog, Roland Robinson, had bad feelings towards me, so I had been told for years by other poets who knew him. One day, at a function organised by Walter Stone in the city, I met Roland face to face for the first time and told him my name. He stared at me in amazement for about five seconds, then said in tones of deepest sincerity: “What a difference it makes to meet a person!” Other poets have shown bad feelings at not being “invited” to contribute to Poet’s Choice, even though the “invitation only” rule was dropped after 1975 when I stopped hand-setting. (In 1976 and 1977 I advertised nationally for poems, on the understanding that I would make the final choice of the “best” poems submitted. Since then, poems have reached me chiefly through word of mouth, or through the efforts of previous contributors.) Moreover, and this must always be the fate of any editor, I am continually being taken to task for my final selection for Poet’s Choice—one poet likes only poem A and rejects the rest of the book, another likes only poem B, and so forth. It seems pointless to suggest (particularly to another poet) that one is after something representative, some thing catholic even, as far as possible, something for everyone—and that any one reader will probably not warm to more than a few of the total chosen. Of all the poems in the ten editions of Poet’s Choice which have appeared since 1970, I have been entranced by only five or six at the most (Purely as a matter of record I could name David Campbell’s “Hotel Marine” (the complete version, which only we printed), Robert Adamson’s “Action would kill it/ A Gamble”, Roger McDonald’s “Incident in Transylvania”, Michael Dransfield’s “Saying Grace”, J. S. Harry’s “what if the big blue day”, and Judith Rodriguez’s “Eskimo Occasion”).The other poems were chosen for other readers, and just as no single one of them has been universally praised, so no single one of them, as far as I know, has been universally deprecated. Perhaps what has surprised critics most is the large proportion of “unknowns” being published for the first time, particularly in 1977 and after. A detail from Swamp Riddles by Robert Adamson. Island Press 1974. The poetry scene during the past 10 years in Australia has been particularly lively and exciting. The period of the birth and development of Island Press has paralleled such notable events as the launching of UQP’s Paper back Poets series, the opting-out of establishment publishers Angus & Robertson and others from all but the “safest” poets, the burgeoning of a plethora of small magazines and presses, and even the founding of a Poets’ Union. I also recall with pleasure such events as the annual Balmain Reading (a whole chapter could be written on this movable feast, first held in 1967 and going on to the early 70s) and innumerable other poetry readings —in the city, in the country, everywhere. It occurs to me at times that the poet is undoubtedly reading the particular poem aloud for the first time ever, that the actual sound of the poem comes as a surprise, even to the poet. There is a widespread ignorance of the fact that the primary appeal of poetry is its sound. 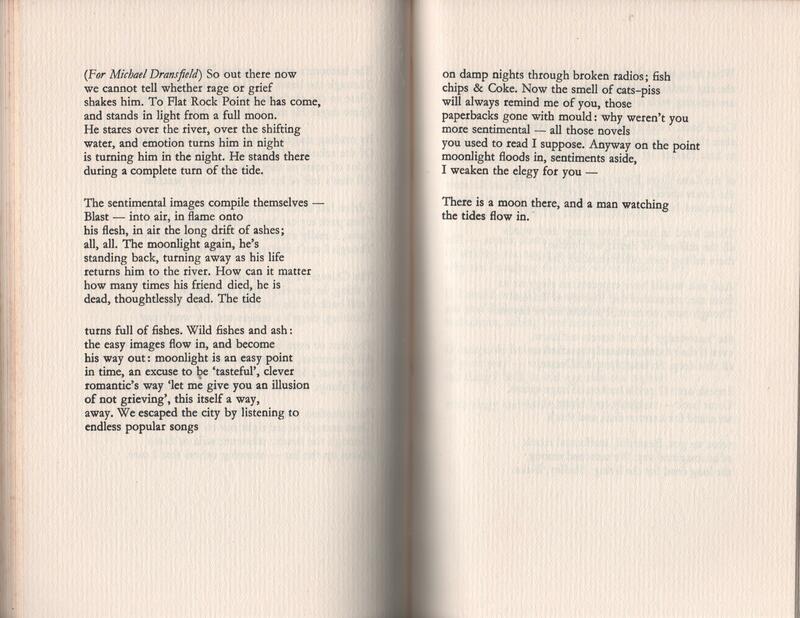 Poets growing up under the Olsen-Creeley-Duncan aegis of Australian verse in the mid-70s often tended to overlook this. This might also seem an opportune time to unload a few remarks on the general divisiveness of poets. As an immigrant, a creature of another (and I think gentler) culture, I was spared much of this misplaced energy. At times, keeping track of the feuding and fighting, who was in and who was out, the Melbourne-Sydney axis, the various personal animosities (sometimes resulting in physical violence) called for more time and attention than I was able to give, particularly with my foot on the treadle and my hand in a type case. Consequently, while I was often the last to find out about such things, I was also pretty safe from direct attack. At one stage I remember gazing at some passing clouds (we were meeting on a lawn) and praying to be delivered from the poets of Australia. I pictured myself lying in a small boat five miles offshore. Who anywhere else but here could have the slightest interest in these people and their problems? My interest as a publisher has always been in the poem, not the poet, in the continual search for that so-rare piece of work that makes you see the world, or a part of it, in a radically new way. Without the actual, tangible success, the birth of some real poem, the words “poetry” and “poet” are like clapperless bells. The publisher’s staying power is directly proportional to his optimism and faith that new work of power and originality will con tinue to be written. His object is to bring that work to its readers as efficiently and effectively as possible. A perfect poem with no readers, like Waller’s rose, is of small worth. Bestowing the regularity of print upon it, like putting a frame around a painting, shows that it is at least to be taken seriously. Canadian Philip Roberts studied as a Rhodes Scholar at Oxford University, taught English in Spain and worked for two years as a sub-editor for Reuters. He moved to Australia in 1967, taught English at the University of Sydney between 1967 and 1979, when he returned to Canada. Roberts was poetry editor for the Sydney Morning Herald from 1970 to 1974. Roberts founded Island Press in 1970.